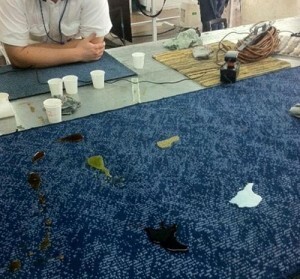 Photo above shows Airline Engineers testing MicroSeal for permanency (survived dry-cleaning), safety (burn test) and for common every day spills – Red wine, coffee, pop, orange juice and milk. In this test MicroSeal proved superior when compared to two other well known fabric protectors. The engineers approved the use of MicroSeal for their Boeing 777 fleet.